Running a webinar may sound intimidating, but the truth is, it’s something any business owner can do. Learn how to easily kick off a webinar and increase your online course sales. Do you remember your first presentation? If it was like mine, your hands shook around the laser pointer like there was a legion of cats after it. You swallowed hard, looked down at your notecards and tried to summon your voice like it was the Kraken (while hoping it wouldn’t be a-crackin’). But if you’re trying to sell online courses, it’s time to change that narrative with webinars. 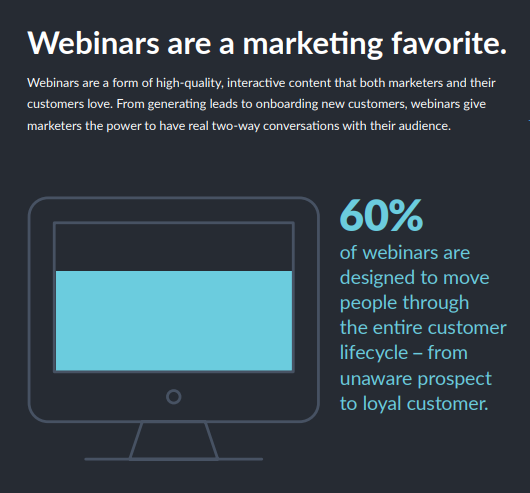 Webinars are one of the most cost-effective techniques for engaging your audience, generating leads, and moving customers through the sales funnel. Today, we’ll walk you through step-by-step for everything you need to launch your course with webinars and improve your sales. First, let’s clear the air: what exactly is a webinar? Webinars are the marriage of technology and seminars, enabling creators to reach their audience in real-time and add a human touch to their business. They’re held, at least initially, with a live audience, and may include interactive elements such as chat. Considered a form of content marketing, webinars can be repurposed into ebooks, used as part of a free online course, and turned into lead magnets. Often, webinars include at least two of the above elements, such as this example from Instructables for webinars that connect students and provide skills-based instruction. Now that’s out of the way, why should you care? Because webinars can be massively profitable lead generation tools and are highly cost-effective. For instance, a single webinar campaign yielded a 756% ROI for one startup company, pulling in nine new high-paying customers and converting at a rate of 52.81%. 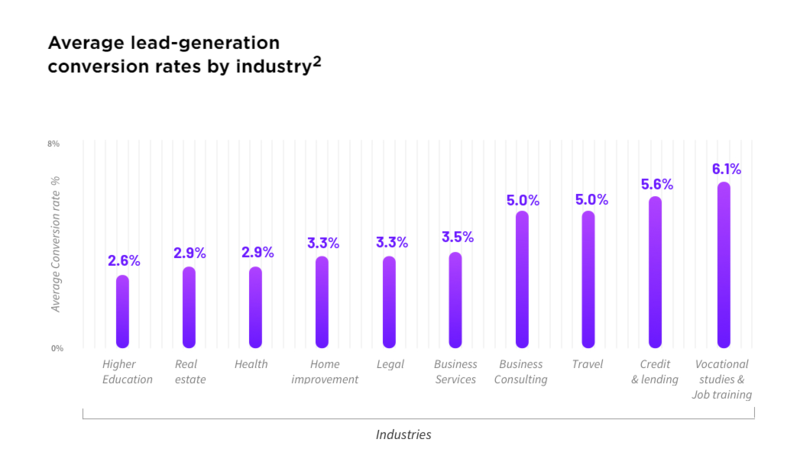 Comparably, most landing pages only convert at a rate of 2.6% for higher education and 6.1% for vocational studies. 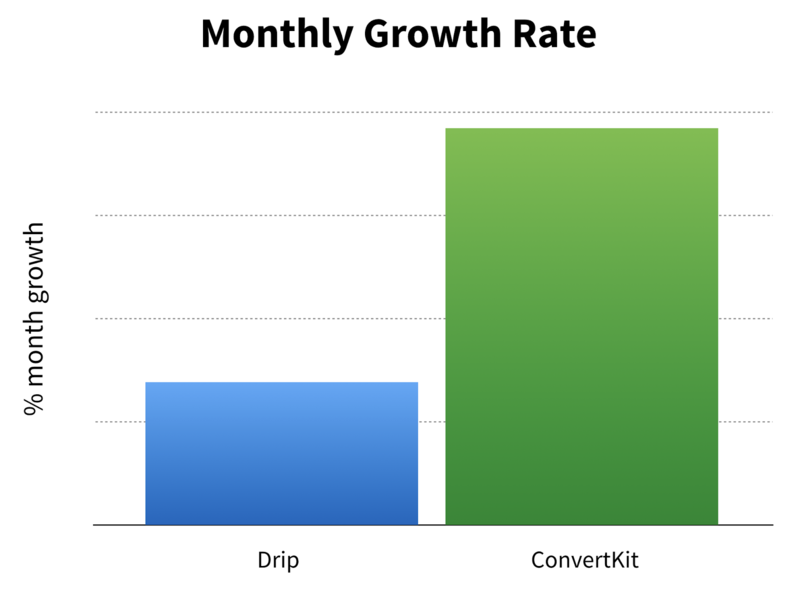 And, if that’s not enough, webinars are a cornerstone piece of the strategy that helps ConvertKit smoke out their competition and pull in $6,000,000 annually. Marketers love webinars, too -- 44% say they’ve hosted or participated in one, and of those, a whopping 87% said it was effective. You’re going to feel the same way. Here’s how to use this strategy to sell digital downloads, launch online courses, and promote your business. 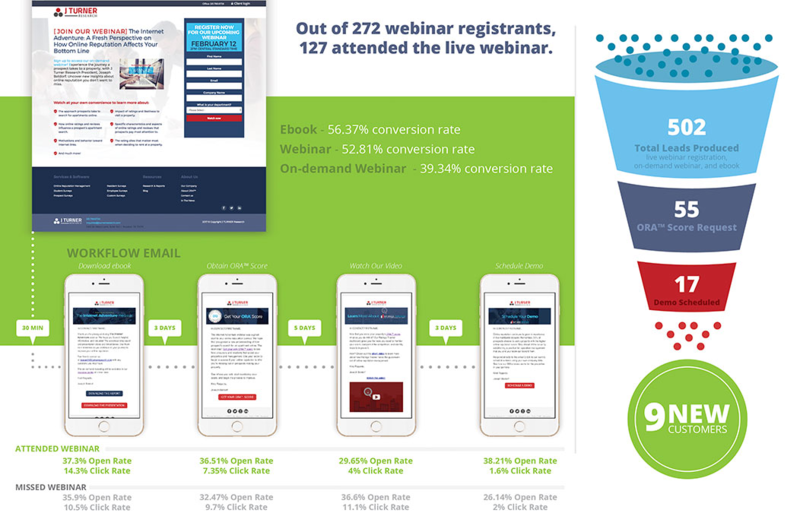 60% of webinars are designed to move customers through the top of the sales funnel down to the bottom (conversion). What’s more: video has helped convince 81% of people to try out a new product or service before. So, how do you start and convince people to try yours, too? Ideally, your webinar should precede your course launch. Pre-launching your online course helps you gauge interest, get feedback, and start building up your subscriber base before you sink your free time into creating the content. But even if you’ve already started your course, the first step to building your webinar is the same: defining who your potential viewers are by building audience personas. 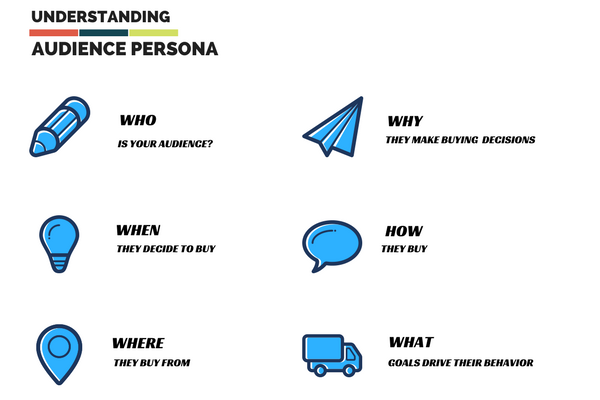 Personas help you get into your customers’ shoes, which is pivotal for meeting them on their home turf and designing an engaging webinar for them. Here are some important questions to ask yourself while building your personas. After you have your personas in hand, it’s time to start considering promotional strategies. If you have an email list for your online course already, start there with your nurtured leads. But if you don’t -- or you just want to maximize your webinar -- paid advertisement is highly effective, especially on Facebook. What makes Facebook a good choice? Because it’s the most popular social network globally, which means no matter how varied your personas are, you’ll be able to cast the widest net to capture your ideal customers. 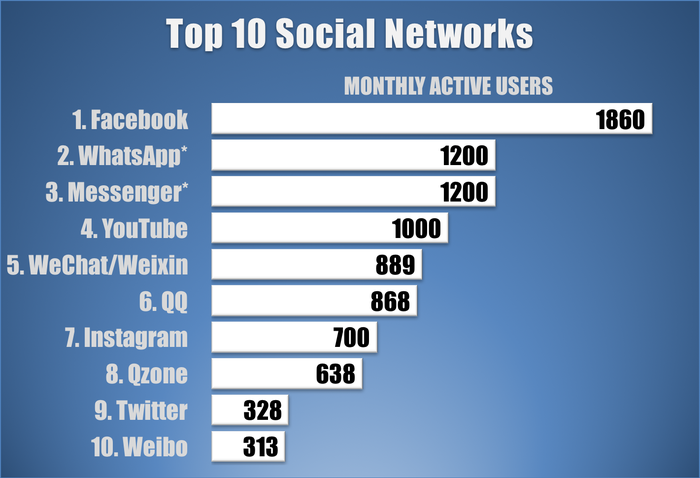 Those numbers are millions, by the way, putting Facebook’s monthly active user base at 1.9 billion. Plus, it has a proven track record for online educators. 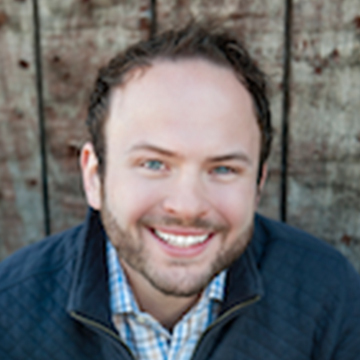 Grant Baldwin uses Facebook ads to sell his live and automated webinars (more on that later) at a 3:1 ROI. $3 in revenue for every $1 spent on advertising? Yes, please. 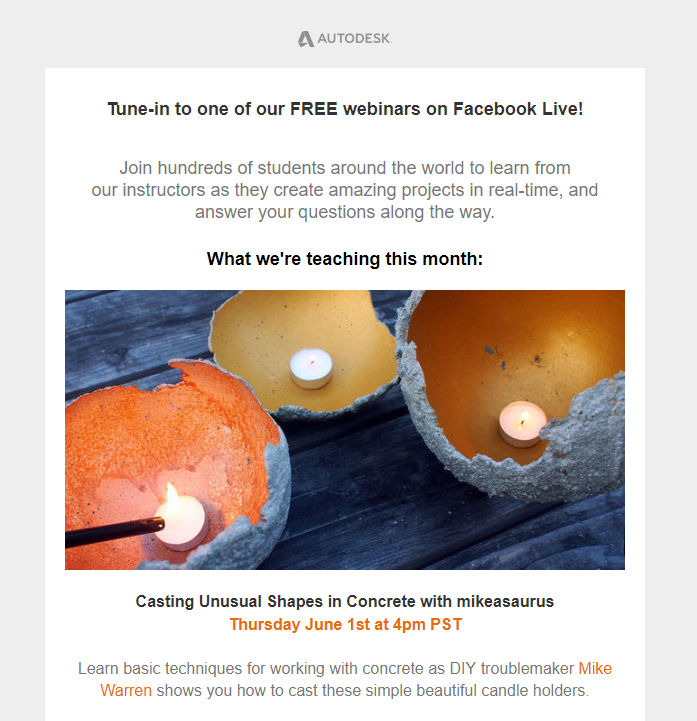 Here’s another: an online training company used Facebook ads to promote their webinar series, building a self-sustaining funnel from zero registrants to 49,000 in nine months. This technique generates some massive social proof for them. It helps that their ROI is a tidy 42.5%, too. So, for cold contacts, Facebook ads are definitely a cost-effective solution for building up registrants. But if you don’t know how to structure your webinar, how can you promote it? For that, check out our next step. For most course creators, educational and workshop formats will be the easiest to get started with. 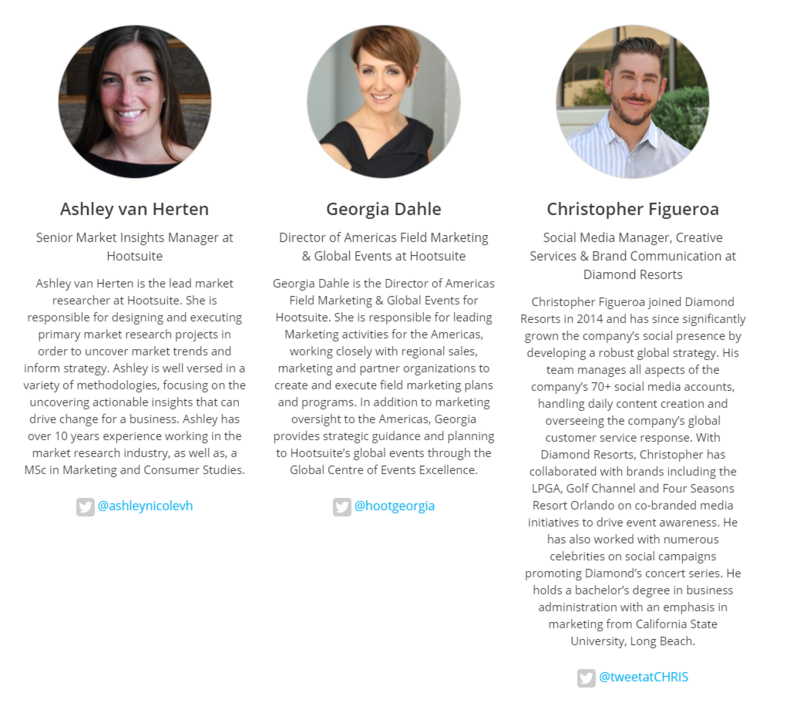 Panel discussions are hosted by larger organizations who have the resources to bring in industry experts or influencers, such as this upcoming webinar by Hootsuite. Likewise, question-and-answer style webinars are left to more veteran businesses, as they require an experienced moderator to keep the webinar on track and field audience questions. “The complexity of your chosen subject, and the availability of suitably qualified speakers, should inform your choice of format,” says content specialist Dan Shewan. So if it’s your first time flying solo, it may be best to fall back on a presentational style webinar. Once you have the format figured out, you need to think about your content. Start with the promise you’re making to your audience. What is this webinar going to provide for them? Is it something they need? Does this help them achieve that end? How? Then, start building your visuals to support that promise. Don’t skimp on this step: visuals are processed faster and require less cognitive resources for people to remember. Which means that incorporating strong visuals helps your audience remember your content (and product) later, and it frees them up to pay more attention to your webinar. As you’re building out your visuals, try to set a rough schedule for each section. After your intro, focus on delivering on your webinar promise. Your pitch should come around the 30-45 minute mark, says online educator and webinar aficionado Mariah Coz. Note that your pitch should be a high point, but not the point, of your webinar. You also want to make sure your visuals stay consistent with your brand. 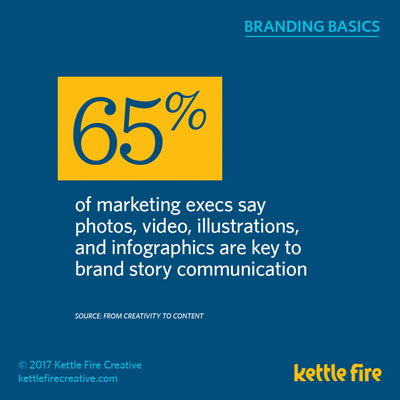 65% of marketers say that visual content is the key to communicating a brand’s story. That means all of your slides, from the introduction to the pitch and beyond, should align with your brand’s colors and style. Beyond that, consider preparing a script or guide notes for your presentation. It’ll help you stay on task and keep your stress down. Using a script helped one creator pull in a net total of $30,000 in profits from her webinars, even with slides described as, among other things, aesthetically displeasing. Finally, schedule in a Q&A session at the end of your webinar. 82% of your audience wants the opportunity to ask you questions live. Deciding on the best tool for hosting your webinar. There are a lot of software options out there for hosting a webinar. Finding the best fit for you is similar to deciding on your webinar format: what fits within your resources. Not sure about the hardware you need? Omar has some advice here, too, singing the praises of the Audio-Technica ATR2100. “Best USB mic for webinars in my opinion. I use a $10 boom from Amazon so it's close to my mouth and I'm hands free,” he says. Plus, it looks pretty cool, which isn’t really related to its function, but a nice addition. For cameras, we recommend the Logitech C920 HD Pro Webcam. It’s an affordable, high-quality option that has an awesome auto-zooming feature so you can stay in focus (and keep your focus). Other points to consider is how to set up your screen during a webinar for screen sharing. Getting a pop-up notification about picking up eggs from the store might be a humorous touch, but it can quickly detract from your professionalism. Decide if you’re going to share a window or your entire screen. A window will only show the program you’re working in, but may become cumbersome if you’re planning to move between different programs. Figure out where to place your notes. Presenter’s notes in Powerpoint (or similar) won’t be visible if you’re working on a single monitor. If that’s the case, consider printing them out -- or even better, write them on index cards and tape them to the top of your monitor. Snooze all of your desktop notifications. It may be easier to create a new user account so you have a fresh, purely professional desktop to start from. Check your resolution beforehand. Surprisingly, lower resolutions may be the key here. You can access this feature in the same area where you change your wallpaper. We recommend 640 x 480. It’ll keep your video size down for future downloads. With that out of the way, here are a few of your software options. Free to use and on the world’s most popular network, Facebook Live gives your audience the chance to know you and dial in from their mobile phones. Your post will stay on your feed, giving you ample opportunity to repurpose and promote the webinar after it’s closed. You can broadcast for up to an hour and a half, which gives you plenty of time to run a one hour webinar. 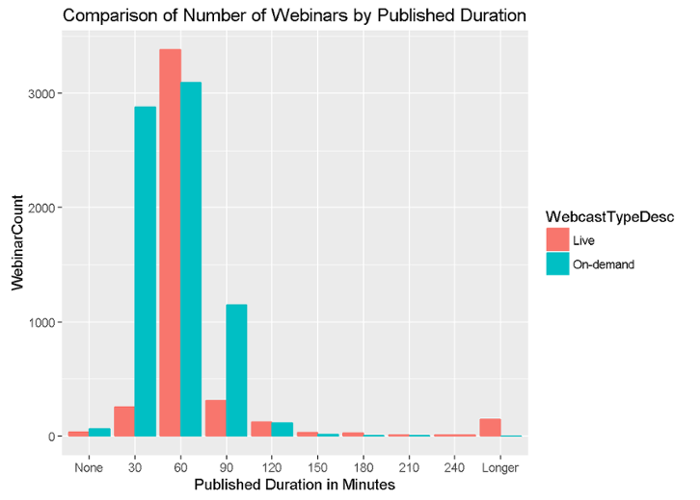 55% of all webinars are an hour long. However, because Facebook Live doesn’t require an email address to view or attend a webinar, you lose out on easy lead generation and will have to put in extra work to convince viewers to join your email list. You also can’t switch back outside of screen share without ending the webinar. One business owner reported accidentally ending their webinar when they tried to switch back into webcam mode for their Q&A session. One last thing to note when considering this platform -- although it’s free, it comes at a different price. Specifically, viewers’ attention: while you’re giving your live presentation, you’ll be competing against Facebook’s many, many other features (chat, personal feed, news stories) for attention. Hopefully, no one on your viewers’ friends feed will have a new kitten video to share. Adobe is a well-trusted name online, and its meetings platform, Adobe Connect, offers a robust set of editing tools. Including registration and marketing analytics, the monthly packages can scale up and start with hosting webinars with up to 100 attendants. Including built-in interactivity features like polls and Word Clouds, Adobe touts a compelling platform to ensure your webinars are as engaging as possible. Like Facebook Live, users can jump right in to view the webinar without any installations. Unlike Facebook Live, however, users on mobile will have to download additional applications to view the webinar. This additional barrier is worth thinking twice about when you think about the fact that most users spend 69% of their total media time on their mobile devices. The price point can also be a significant detriment for course creators who are working with smaller budgets or don’t plan to host regular webinars. The scaling difference between the first and second tier package is notable and offers few course creators the wriggle room they may need as they grow their business and audience. If you’ve ever attended one of our webinars or read through our previous posts, you probably already know: we’re pretty big fans of WebinarNinja. From its ultra-affordable pricing to its mega-scalability, there’s a lot to love about this platform. You can check out our earlier post for landing your first-course sale to see how to set up your first webinar with WebinarNinja. With no limits on the number of webinars you can host, and up to 1,000 live attendees for each session, WebinarNinja is our go-to solution for ourselves and recommendation for our clients. Plus, you get a ton of extra features with every plan that you can’t get with other platforms. All of these are great, but one of my favorites is the ability to add timed incentives to your webinars. Limiting the amount of time that you display your products or special offers can significantly increase your conversion rates. Using this method pings customers’ fear of missing out, and helped one company boost their webinar attendance rates to a staggering 75.62%. It’s also the same rationale behind Amazon’s lightning deals and low stock warnings. So if you want a webinar platform built for the busy entrepreneur without prices that will make your skin crawl, WebinarNinja is the golden road for you. This brings us to our last section of the day: after you’ve set up your webinar, decided on your content, settled on your platform, and given a presentation that’d make the academy awards applaud, what’s left to do? Let email marketing work its magic. Did you know prospects are 60x more likely to convert if they get your marketing email within an hour of the event? But coming down off the rush of a great webinar is a buzzed, jittery feeling -- and you’re not going to want to think about having to send emails. Which means you need to have your ducks in a row for your post-webinar campaigns well before your webinar airs. If Gmail is your preferred email platform, a tool like GMass can be used to schedule your emails ahead of time and make sure it gets there at the perfect opportunity for conversions. 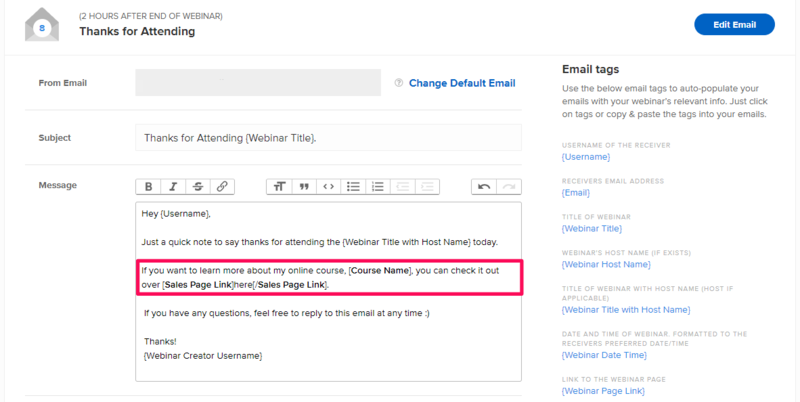 Alternatively, if you’re using WebinarNinja, you can set this up easily from your dashboard. Here’s how. First, log in and pop over to your “My Webinars” dashboard. Next, click on the “options” tab to open the drop-down menu. From here, you can control and edit your entire email sequence. WebinarNinja awesomely comes preloaded with plug-and-play email templates. WebinarNinja sends out emails two hours after the end of the webinar by default, so all you need to do is plug in your product sales pages in the template. If you want to learn more about my online course, [Course Name], you can check it out over [Sales Page Link]here[/Sales Page Link]. These emails will be sent out to users who watched your webinar after it airs, too, if you leave it open for registration like we did when we partnered with Becky Mollenkamp. And you definitely should consider leaving your webinars open. Many of the case studies cited in this article made half of their income by repurposing their webinar as an evergreen lead magnet. The majority of people who see your webinar won’t be live, so make sure you don’t discount them from the funnel and give them the opportunity to access the goods later and join your subscriber list. If you’re not using a platform like WebinarNinja with built-in email sequencing, you’ll want to set up a drip campaign for your registrants to keep them nurtured. Ideally, create two campaigns based on if the registrant was a live attendee or viewed the webinar later. Ensuring your emails are relevant to the receiver can reward you with 18x more revenue. Plus, automating them takes the pressure off you and lets you enjoy the fruits of a successful webinar rather than worrying about the harvest. Email is your go-to solution for post-webinar nurturing, but you need to move fast. Instead of trying to do it after your webinar, set it up ahead of time with automation tools. Keep your webinar available for download to continue getting leads well after the event. Set your webinar up before your course, if possible. This will help you get feedback and create more tailored content for your audience. Launch your webinar to your email list first. Don’t have one or want a bigger platform? Facebook advertising has been wildly successful for webinars in the past. Decide on the structure of your webinar from the start: if bigger and bolder doesn’t make sense for your budget, there’s no shame in the tried-and-true presentation format. Next, set up your schedule, script, and visuals. Try to keep these consistent with your brand. Then, find a platform that works for you. Facebook Live may be a good and free place to start, but it has a lot of drawbacks. 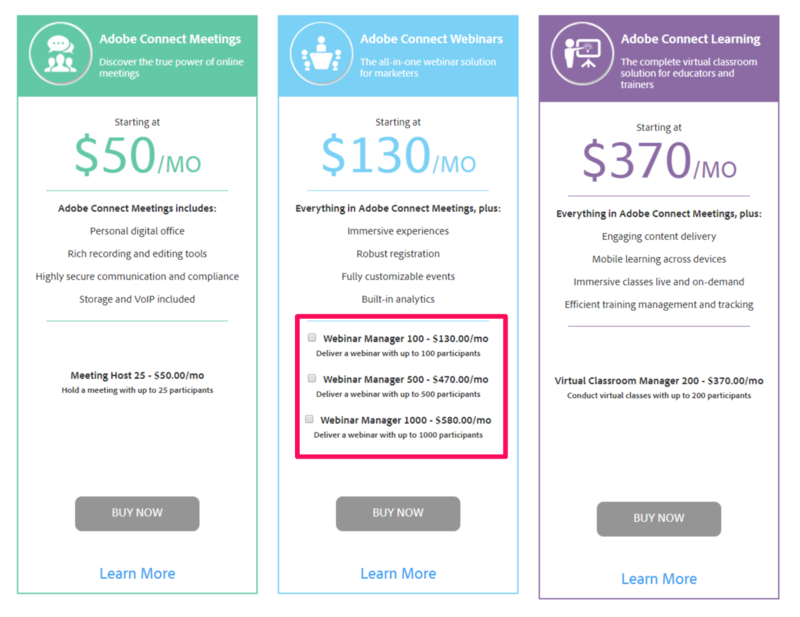 Adobe Connect and WebinarNinja are both excellent paid options, albeit at wildly different price points. After that, it’s showtime. But your work isn’t quite done yet. Set up an email sequence ahead of time to nurture your leads from the webinar before they go cold. Don’t forget to keep your webinar available for future viewers, too: they’re great lead magnets. Combine these steps with a little practice and a dash of bravery to rock the webinar sales game and sell more memberships, digital downloads, and online courses. Len Markidan is the CMO of Podia, a platform for creators to sell online courses, membership sites and digital downloads. He’s created and sold six-figure online courses using strategies like the ones in this article. Get his free 12,000+ word guide to creating profitable online courses, even if you’ve never done it before.